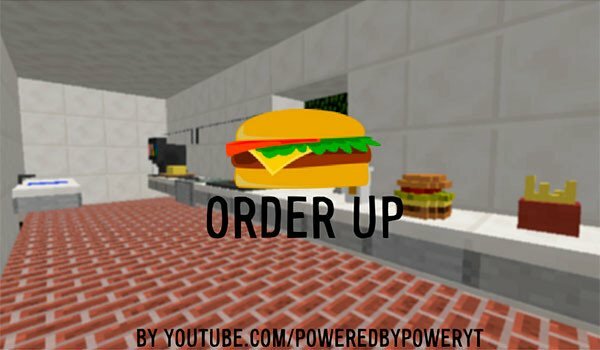 Fast food comes to Minecraft. Order Up Map 1.8 is more like a minigame than a map, because it adds a pack of resources including the map. This minigame you will be a worker from a fast food chain. This will start inside a kitchen where will start arriving customers that you will see through a window. The villagers will be hungry so you will have to feed them. Customers are on their minecarts and they will stop in front of the window of the store and they will order you things like a double cheeseburger with onion, some fries and soda. You, as a good worker, will have to prepare these orders, cooking the hamburguer on the plate, cutting the cheese and the onion, and frying potatoes as well as preparing the drink You must remember that this is a job, if you relax too much, customers will leave the your store. How to install Order Up Map for Minecraft 1.8? Paste the downloaded folder “Order Up 1_8” inside of the download file, into “saves” folder. Paste the downloaded folder “Order Up Resource Pack” inside of the download file, into “resourcepacks” folder. Start serving orders to hunger customers!